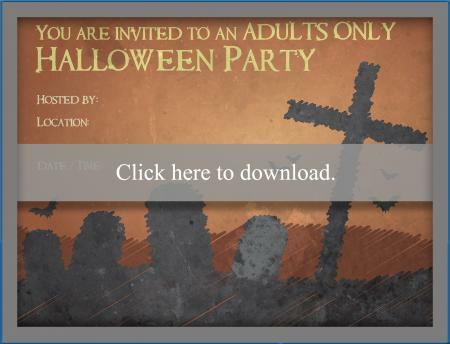 Find the perfect invitation to send to the people on your guest list for an adults-only Halloween party. You can print or make your own if you plan to mail them, find plenty for purchase, or even send some electronically to save time and stamp money. Use free printable invitations for a quick solution to getting everyone to your party. If you need help downloading the invitations, check out these helpful tips. Let guests know you plan to have plenty of drinks during the festivities by sending out this invite. This invitation features a witch standing in a graveyard and has a purple, orange, and black theme. There is a large full moon in the sky and a few playful bats flying in the sky. This invitation is 8.5 x 11 inches and will print on standard copy paper from a color printer. Send this graveyard invitation to your guests to help put them in a spooky mood. This invitation has an orange background with gravestones in silhouette. There are bats flying in the distance against an orange and brown sky. The invitation is 11 x 8.5 inches and prints on standard copy paper with a color printer. 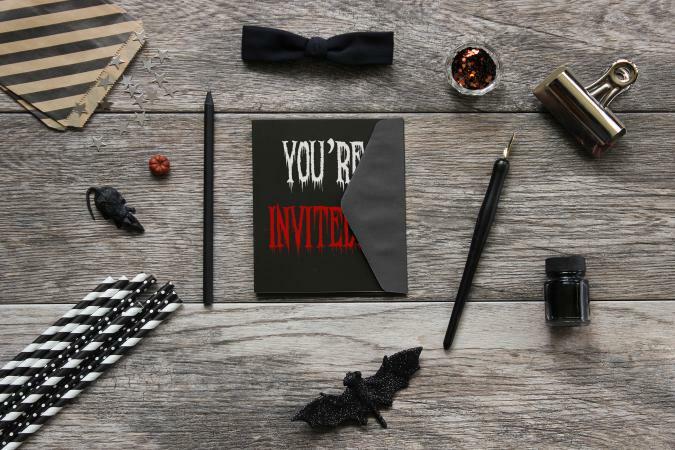 If you enjoy card making, you can make your own Halloween party invitations to send out to the adults you plan to invite. Follow the directions below to make your own simple invitation. Use a paper cutter to make cardstock inserts for the half-fold cards. Measure them so a half-inch of black is showing when placed on the inside of the folded card. Print off invitation information using black, bold fonts onto the orange cardstock. Open the invitation so it lays flat. Dip your Halloween stamp into embossing ink and stamp onto the front center of the card. Sprinkle embossing powder over the image and lightly tap excess off. Hold image over heat source until powder melts together. Let image rest for a few minutes, then fold card. Optional: Glue ribbon onto front of card in a bow, below or above embossed image. Attach small charm to the center of the bow. Optional: Use additional colored paper to emboss or print a message on the front such as "You're Invited". Glue the orange invitation information into the inside of the invitation card. These invitations are simple, yet elegant. If you want to add a clever saying, try using a Halloween card quotation on the front or inside of the card. Create your own invitations by registering for a free account with an online invitation site. While the specific instructions may vary from one site to another, the basic procedure involves creating an account using your email address and a password of your choosing. You'll be able to enter the Halloween wording of your choice and be given an opportunity to preview and make changes before sending. Finally, enter contact information for the invitees and send the message. Spooky Haunted House: This haunted, spooky house is perfect for inviting adult guests to a haunted house or other Halloween themed party. Bats: Black, purple, and brown bats are set against an antique paper background. Simply add the details to create a sophisticated Halloween invitation. Ghostly: If you are a foodie, this invitation featuring an edible ghost might fit perfectly into your party theme. Mouse Motel Halloween Invitation: Give guests a preview of the upscale party you have planned with this adorable invitation featuring mice crawling inside of a pumpkin. Glowing Skull Halloween Invitation: This invitation features a glowing skull on a table. Bow Tie: A sophisticated Halloween party might even be a black tie affair. If so, pick this invitation that features a simple design with a black bow tie. Spooky Woods: A photo of a dark and gloomy woods is accompanied by spooky sounds. Pirate Theme: This invitation is the perfect choice if you're hosting a pirate-themed Halloween party. Costumed Adults: If you are hosting a costume party, invitations for adults often have costumed men and women on the front. Examples include the Sinister Couple invitation from Announcing It and the Naughty Witch theme from Polka Dot Design. Elegant: Elegant Halloween invites may feature shiny ribbons, sparkly pumpkins, fall foliage scenes or flowers. Look for invites with scripted fonts and scroll motifs. Good examples include the the Guys and Ghouls Night Out design from Purple Trail. Simple: Sometimes the best invitation is a simple invitation. Plain backgrounds, black, orange or brown lettering, and maybe one or two blacked-out graphics are simple but get the point across. Adults do not always need the "frills" that kids do when it comes to invitations. You may want to consider the Basic Black design from Zazzle or any one of the basic postcard and paper designs available from Paper Direct. Cocktails: Hosting an adult party often means offering up some alcoholic beverages. 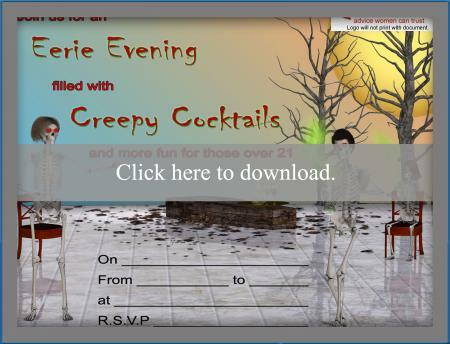 If this is true for your party, look for an invite that features a cocktail design with some spooky elements, like spiders or bats. The Eat, Drink and Be Scary design from Polka Dot Design and the Martini Adult Halloween Invitations from Etsy are good options. 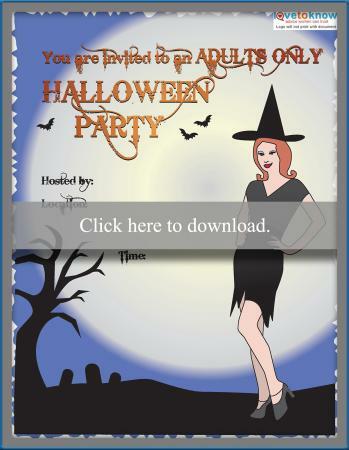 Scary: Skip the cutesy mummy or happy pumpkin on an adult Halloween party invitation. Instead, look for ones that have haunting, barren trees, gory severed body parts, life-like gravestones or skulls and crossbones. The Graveyard Postcard from Zazzle is a good option. Remember to add any pertinent information, such as the time of the party, whether RSVPs are required, and whether the adults should come costumed or dressed in orange and black, to the invite before sending. If any of the invitations do not mention the party is for adults only, feel free to add that in with a small asterisk symbol and a mention at the bottom of the invite. 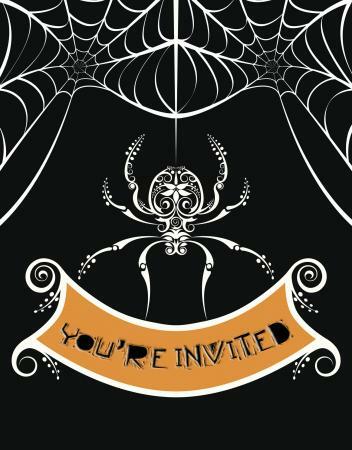 Invitations are an essential part of the Halloween party, so make sure yours are top-notch!